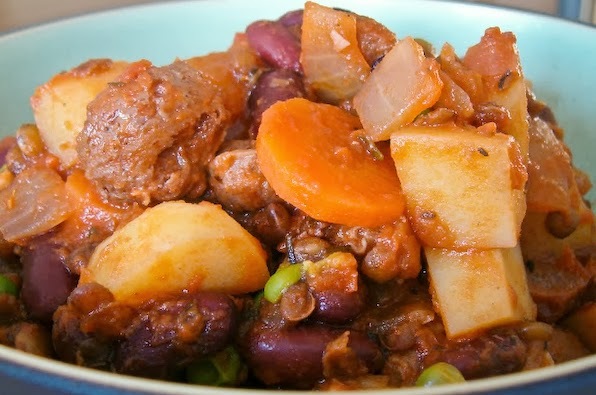 This is a slightly adapted recipe of 'Cholent' in Veganomicon. They called for caraway seeds and tarragon but I personally am not keen on any 'liquorish' tasting herbs so, I used more traditional stew herbs of rosemary, sage and thyme and loved this. In fact it tasted so much like my mom's stew growing up (which is what I was after). They also added TVP chunks, which you can see in the photo there but we weren't keen on those so I no longer add them. I'll try and update this photo soon! It's warm, comforting, nutritious and filling; we serve it with fresh from the oven bread rolls slathered with vegan butter to dip into the stew - lovely! This has become an autumn/winter family favourite. Wash and rinse the lentils well. Bring a pot of water to the boil, add the lentils, stir, put a lid on and fast boil for 10 minutes. Drain in a fine sieve, rinse well with cold water and set aside. In a large saucepan heat the olive oil. Gently fry the onion with a few grinds of black pepper until soft and translucent. Add all the herbs, garlic and salt and fry gently for about a minute, let it get really fragrant but be careful not to let the garlic burn – keep it on low heat. Add the red wine to de glaze – give it a good stir, then add the carrots, potatoes, par-boiled lentils, chopped tomatoes and the water. Cover, bring to a boil then reduce the heat to simmer. Let it simmer for about 30 – 40 minutes or until the potatoes, carrots and lentils are cooked and the stew has thickened. When there is about 10 minutes left, add the kidney beans and frozen peas. If it is still too liquidy, cook a little longer with the lid off until it is the right consistency. If it’s too dry, add a bit more water. Season to taste and serve.